In this tutorial, you’ll learn how to integrate with GetResponse using PayKickstart’s API integration. Step 4: Choose ‘GetResponse 360’ on the dropdown menu for ‘Email Services Available’. Step 5: Log in to your GetResponse 360 account. Copy your API key that is found under My Account >> API & OAuth. Step 6: Enter your API URL provided by your account manager, and the Domain URL that your GR360 installation is at (where you login). Step 7: Once you’ve connected, you’ll need to go to ‘Campaigns’ on the left sidebar of your dashboard. Here, you’ll see your campaigns listed. Choose the PRODUCT that you want to integrate Get Response with and select “edit product settings“. Step 8: In the Product settings, select Step 3 (Integrations) to open up your integrations information. Step 9: In the product settings(integration section), please enable the email integration field. Step 10: If you’ve correctly integrated with the main area (steps 1-6 in this tutorial), then you can now select ‘GetResponse’ in the Email Integrations. 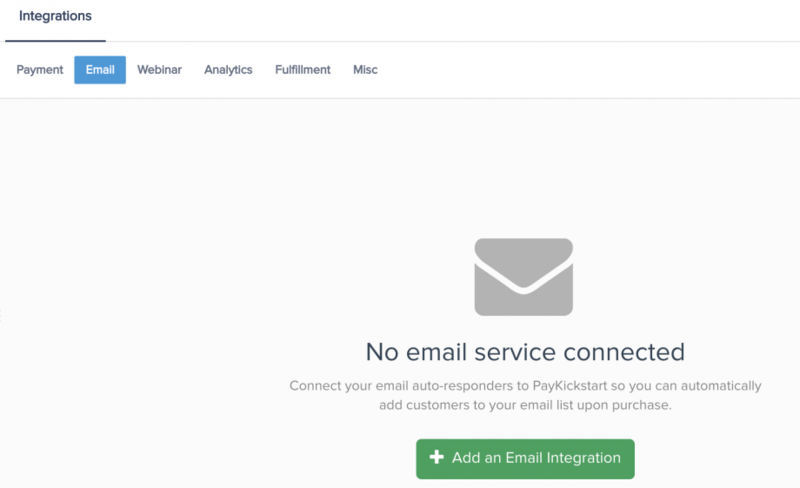 Choose ‘GetResponse’ as your email service. Step 11: Once you have finished editing the settings, click “Save” and your product is ready to add users to your GetResponse mail lists. Now, when a customer purchases your main offer product, they’ll automatically be added to this Get Response list that you’ve chosen.